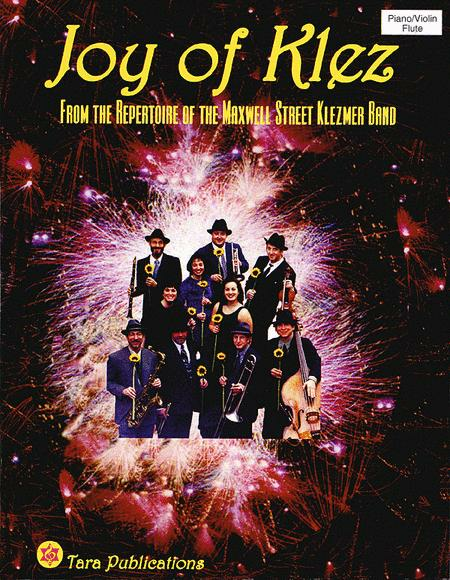 (From the Repertoire of the Maxwell Street Klezmer Band - Piano/Flute/Violin) Performed by Maxwell Street Klezmer Band. Performance parts book for acoustic bass, piano, violin, mandolin and flute. With standard notation, chord names and discography. 31 pages. Published by Tara Publications. ISBN 1928918492. With standard notation, chord names and discography. Klezmer, Jewish and Middle East. 8.5x11 inches. These arrangements are based on recordings from between 1910 and 1940 of Eastern European immigrant musicians who played traditional Jewish dance music for weddings and other celebrations. Many of these pieces were transcribed to help teach Klezmer styling to participants of the biennial Midwest Klezmer Workshop. The arrangements have been prepared to accommodate different ensemble instrumentation, with many parts partially or completely doubling each other.